Brookforge supply the full range of pool equipment, products to domestic & commercial swimming pool and leisure establishments. We are not just an online shop, we're swimming pool experts who can advise and specify the right pool equipment for your swimming pool at highly competitive prices. 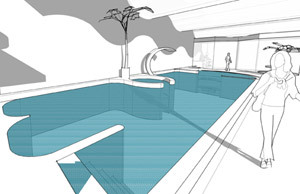 Also offering bespoke pool design drawings and installation packs, we can help you acheive your perfect pool. Brookforge offer a unique service to all people considering building their own swimming pool; be it indoor or outdoor; tiled, liner, panel, fibreglass or concrete. Whether you are the property developer, architect, quantity surveyor, M&E engineer or end-user, our team of swimming pool design engineering experts can offer you help and advice, throughout every stage of your dream pool's construction - from first excavation to final commissioning. We can specify and supply all the swimming pool equipment and materials required for any size of swimming pool or spa, be it a domestic or a commercial swimming pool.